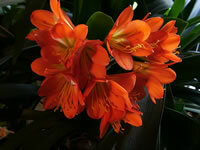 The Fire Lily Plant, Clivia miniata, is native to South Africa. bright orange or red flowers that rise above the broad, 18" dark green, straplike leaves. Unfortunately, Clivias are only hardy in USDA zones 10-11 and will not tolerate temperatures that drop much below 50°, so they are most commonly grown as house plants. In the garden, they should be grown in a bright but lightly shaded area and kept reasonably moist during the growing season, but drier during dormancy. In their native environmment, Clivias reside in forests where their thick roots grow through the natural forest litter, rather than sending their roots down into the soil. With that thought in mind, plant your Clivia in a shallow, spreading fashion and provide a thick blanket of compost as mulch. Clivia miniata is very well adapted to growing in containers, and will even bloom better and more consistently when they are pot bound than if they are growing in the ground. They should be planted in rich, well draining soil. Water thoroughly, then allow the soil to dry completely before watering again. Never allow your Clivia to set in a saucer filled with water! 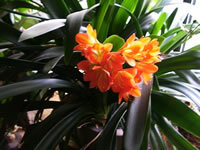 As a House Plant, keep your Clivia where it will receive bright, indirect light and never direct sun. When they are actively growing, Clivias need day time temperatures between 65° and 75°. Clivia plants require a dormant period from October through January when they must be kept cooler (50°-55°) at night and only watered sparingly. When new growth begins to emerge in early spring, increase the night temperatures to 65° and begin to water thoroughly again (...but let the soil dry between waterings). Feed your Clivias monthly with a good house plant fertilizer. Mist your Clivia occasionally during the growing season, and wipe the dust from the foliage with a damp cloth regularly. Watch out for mealybugs, especially when growing Fire Lilies in the garden. Plant it in a small clay pot but don't water for a few days to give the cuts to callous over. New roots will begin to develop within a couple of weeks. 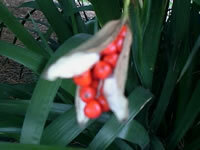 Clivias can be grown from seeds, however the seeds MUST be removed from the pods and planted while they are still fresh. Germination requires a soil temperature of 75° to 80° F. and will takes 30-40 days.